What do you say when someone asks if you will accept a donation of ballet slippers for children and adults who need dance shoes? Naturally, you say, "Thank you. We would be glad to take them." But then when they then tell you that they are donating 419 pairs of brand new slippers? First, you steady yourself on the desk and then you say, "Of course, we will take them and thank you so very much." This windfall actually happened in January 2014. Demi Point Dance Shop of Charlottetown, PEI made their generous offer to Dance NS. Because we are in a unique situation where we represent the dance community as a whole and we are able to accept donations from people or groups towards a specific project or endeavor. Since receiving the slippers we have been distributing the shoes to both children and adults through the province as well as donations of slippers to the Casta De Arte (The Art House) in the Dominican Republic (through the efforts of Johanna Hilchie of The National Ballet School). As stated, these are new ballet slippers from brand names such as Angelo Luzio / BodyWrappers and Capezio, and are in children and adult sizes so we can help young and older children, as well as adults. Although stored in Halifax, these slippers are available to Nova Scotian families in need. THE ONLY REQUEST IS THAT YOU COME TO THE DANCE NS OFFICE TO GET THEM. CLICK HERE FOR DIRECTIONS. Contact us to set up a time to come in and try a pair on. 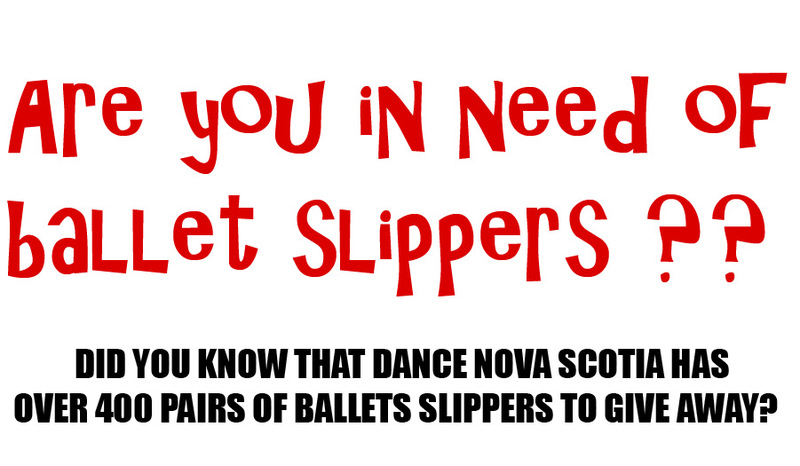 Please complete the forms and mail them to Dance Nova Scotia, 1113 Marginal Rd. Halifax, NS B3H 4P7 You can also email the completed form to office@dancens.ca OR bring the form in when you come to pick up the shoes. Dance NS is grateful to Demi Point Dance Shop, Charlottetown, for enabling so many children to follow their dreams.